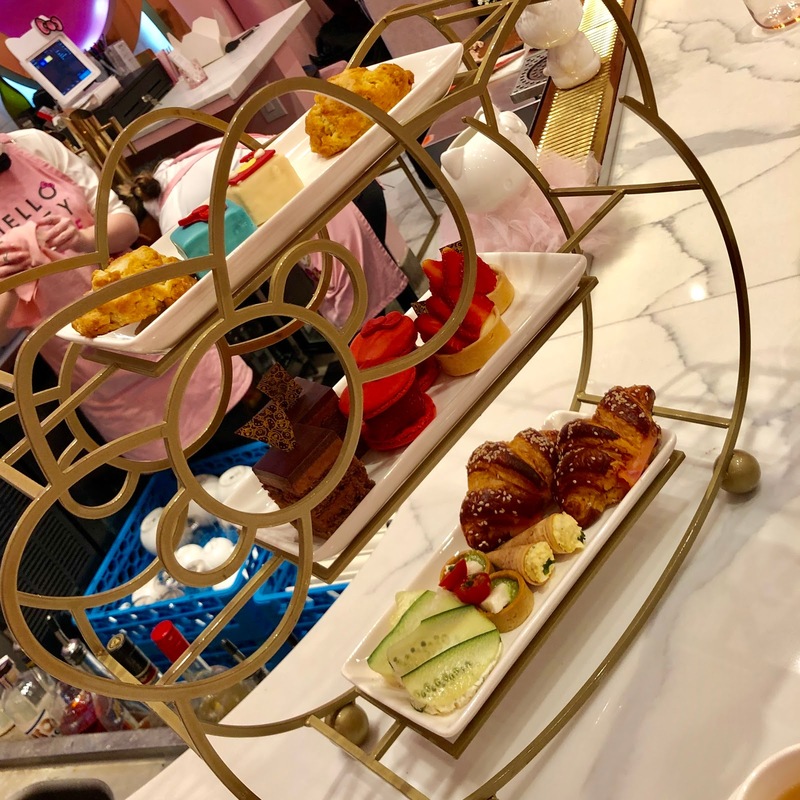 I love two things: Hello Kitty and high tea. 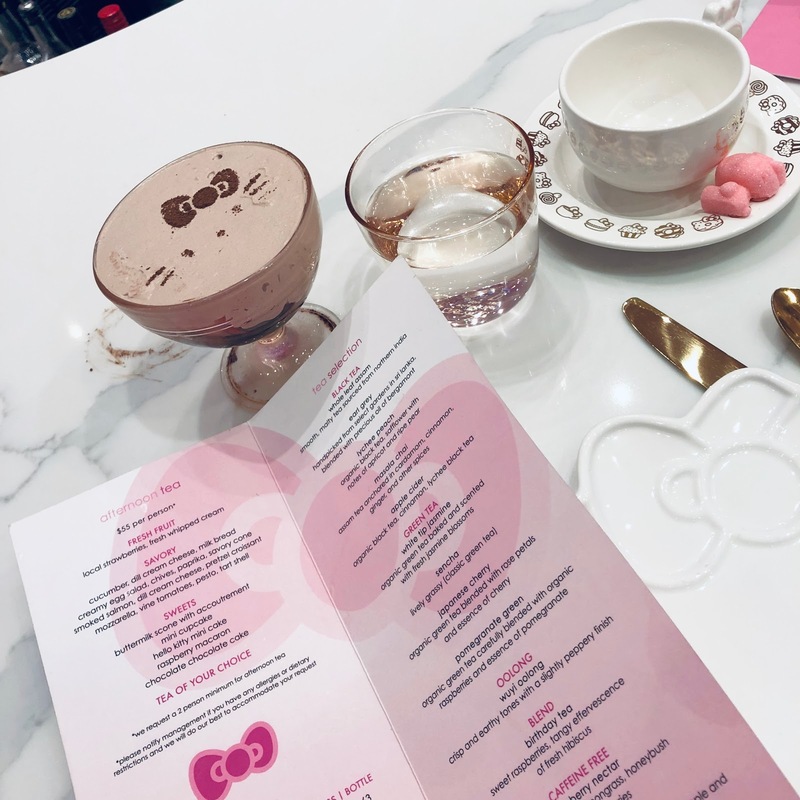 So when I found out that, not only is there a Hello Kitty Grand Cafe in Orange County, but that they serve afternoon tea, I absolutely jumped at the chance to go! I immediately texted my friend Erin to see if she'd want to go with me, and her resounding "YES!" came back about 5 seconds later. 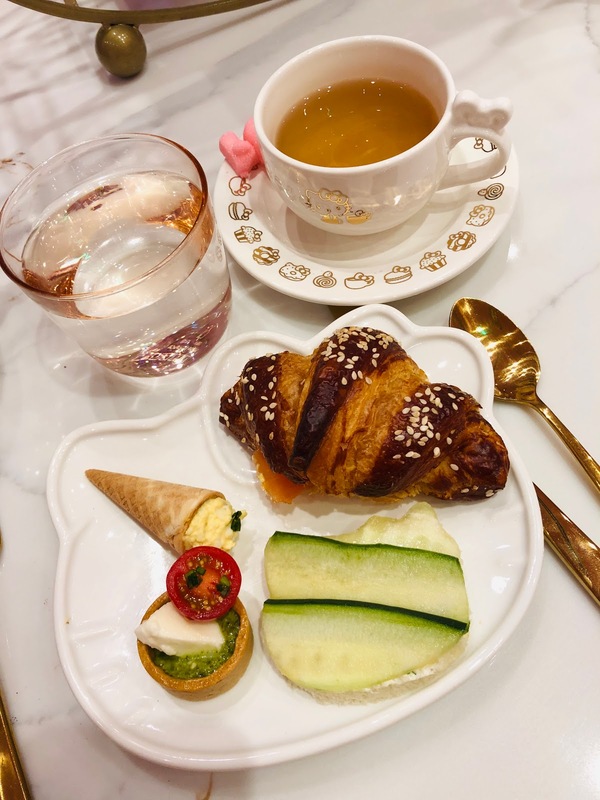 So we made our reservation, (im)patiently waited the month and a half for the day to arrive, and finally stepped inside the magic that is this totally adorable cafe. When I was a kid, my mom used to take my brother and me to high tea at the Ritz-Carlton in Cleveland every year. It was a special day out that we looked forward to every year -- we got dressed up, ate cucumber sandwiches and listened to the harpist in the corner. 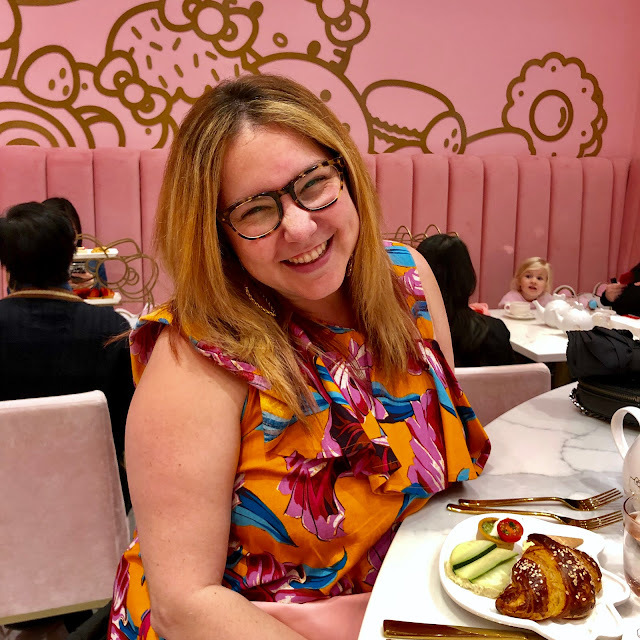 My love of high tea has definitely carried into my adult years, and, while I don't get to go as much as I would like, I definitely take every opportunity presented to me to enjoy it. And, come on, who doesn't love Hello Kitty? 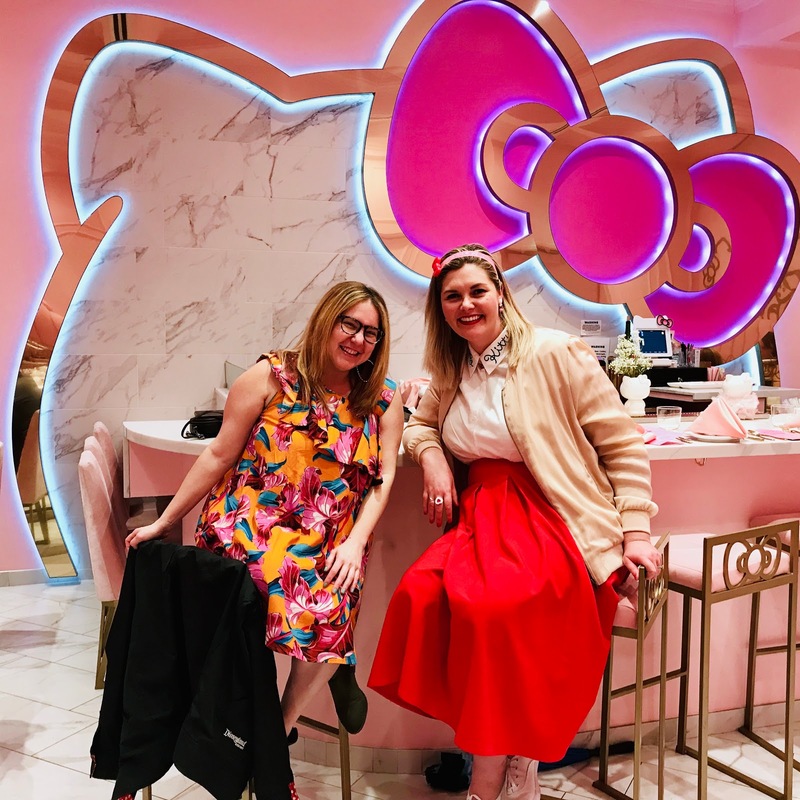 Every single portion of this experience is, of course, Hello Kitty themed -- which just makes it all the more adorable! 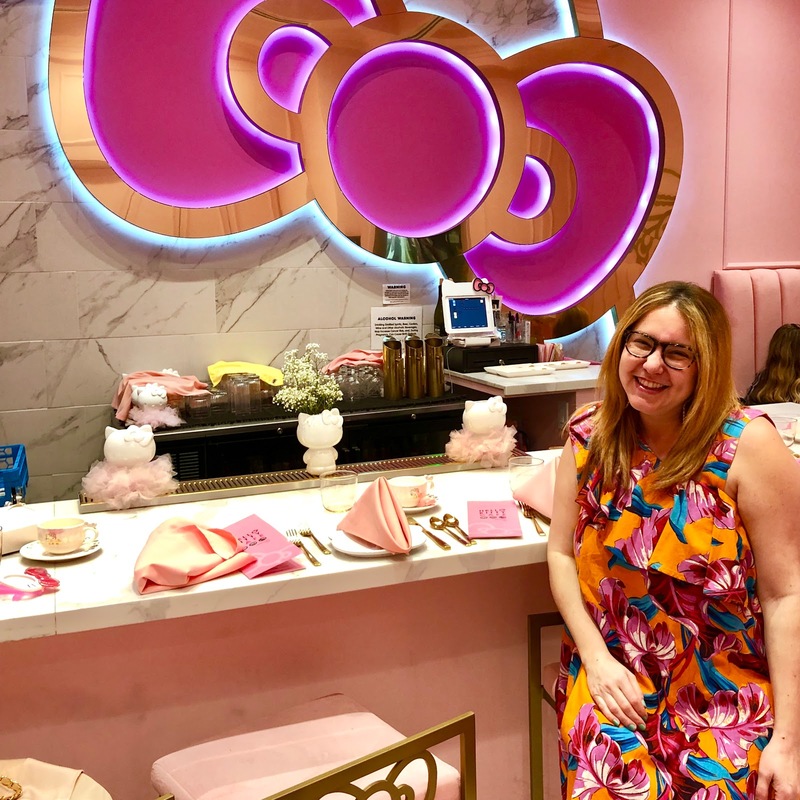 We were given bar seating, which I have to admit was mildly disappointing as I would have loved to sit in a tufted pink booth, but we made the best of it. Plus, we got very personalized service from the bartenders, so that was pretty special! The experience starts with a strawberry mousse that's made up of chocolate mousse atop a collection of fresh strawberries -- and it has a Hello Kitty face adorning the top! Yeah, it's cuteness overload. Yeah, it's par for the Hello Kitty course. Starting the tea off cute with strawberry mousse. 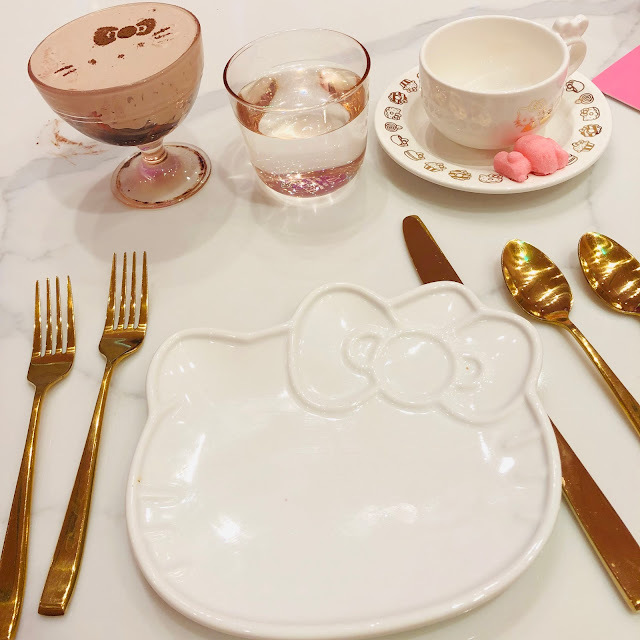 Every detail is Hello Kitty themed, down to the shape of the plate and the sugar for your tea! Then you have the opportunity to choose your own pot of tea from the AMAZING menu. I asked for recommendations, because I seriously wanted every single flavor! I decided upon Birthday Tea, which is a mix of sweet raspberries and fresh hibiscus. I really love getting my own pot of tea -- it just always makes me feel so special. And this tea was delicious -- not too sweet, not too floral, but just right. And since I just celebrated my birthday not too long ago, it felt apropos! A Hello Kitty shaped cage of sweet and savory foods. Tier after delicious Hello Kitty shaped tier! All of these savory foods were beyond delicious. Look at that adorable egg salad cone! If you can't tell, I was enjoying every single second of this experience. 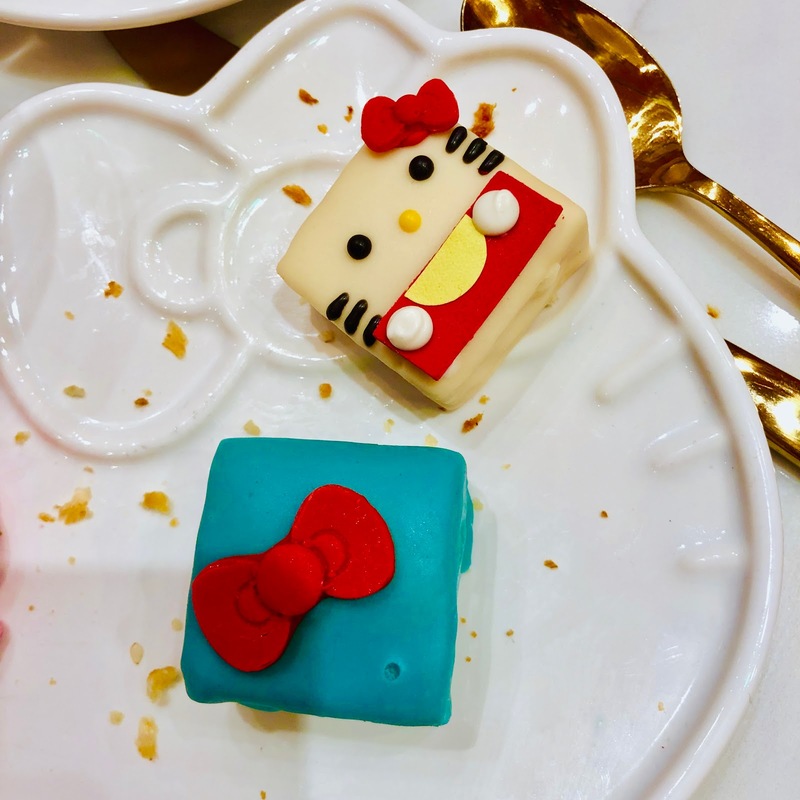 I always love a petit four -- and when they're Hello Kitty themed? Sign me up! There was honestly so much food that Erin and I couldn't believe our eyes. We gasped aloud when the cage came toward us! Everything is the perfect size -- not too big, not too small, just dainty and adorable. My standouts were the egg salad cone, the Hello Kitty mini cake and the salmon sandwich, although everything was completely delicious. Hello Kitty lemon jelly palate cleansers. 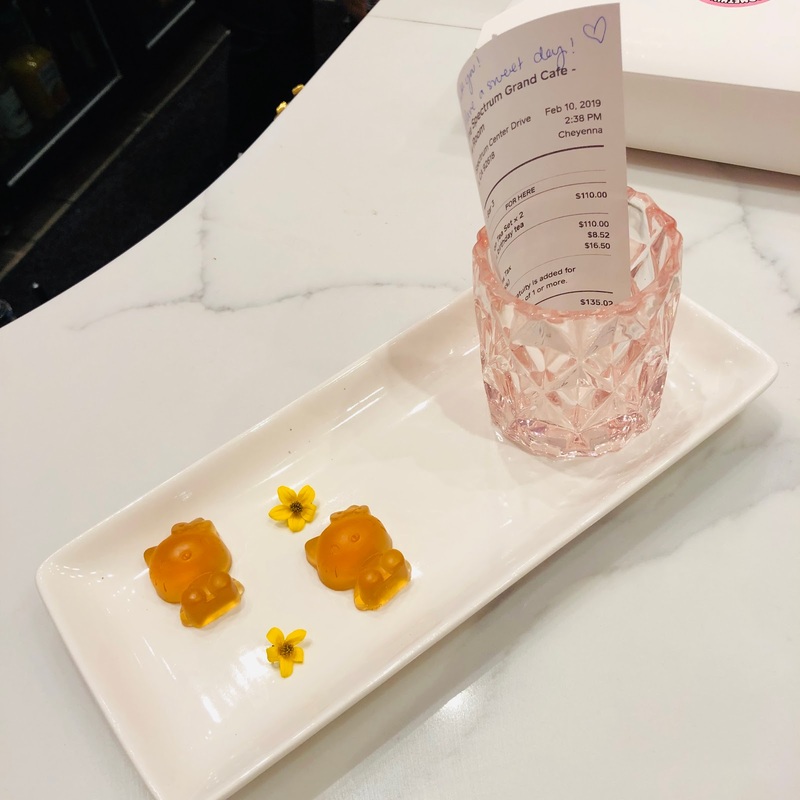 Before you leave, you're given miniature Hello Kitty shaped lemon jellies to cleanse the palate. Just another adorable touch! 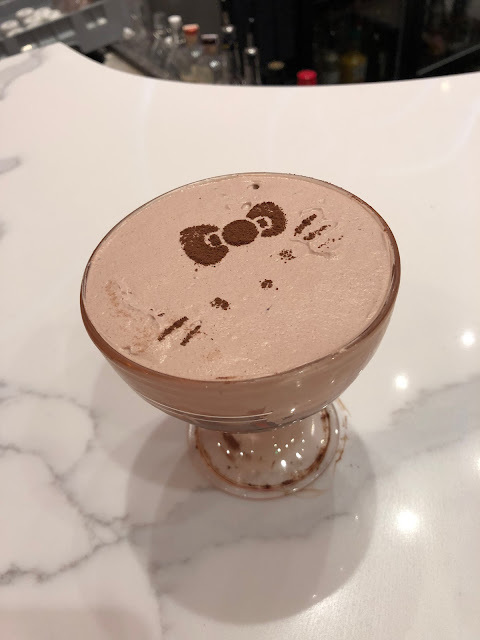 If you like Hello Kitty, I would definitely recommend a visit to the Hello Kitty Cafe -- it's a unique experience that you won't have anywhere else! Enjoying a delightful afternoon at the Hello Kitty Cafe with Erin! Afternoon tea is $55 per person, plus gratuity. For more information and to book a reservation, visit sanrio.com. What a fun day you two had! OMG, that’s about the cutest tea I have ever seen! The food sounds delicious too. What a fun afternoon with a friend! I’d love to go! So very cute and fun indeed! 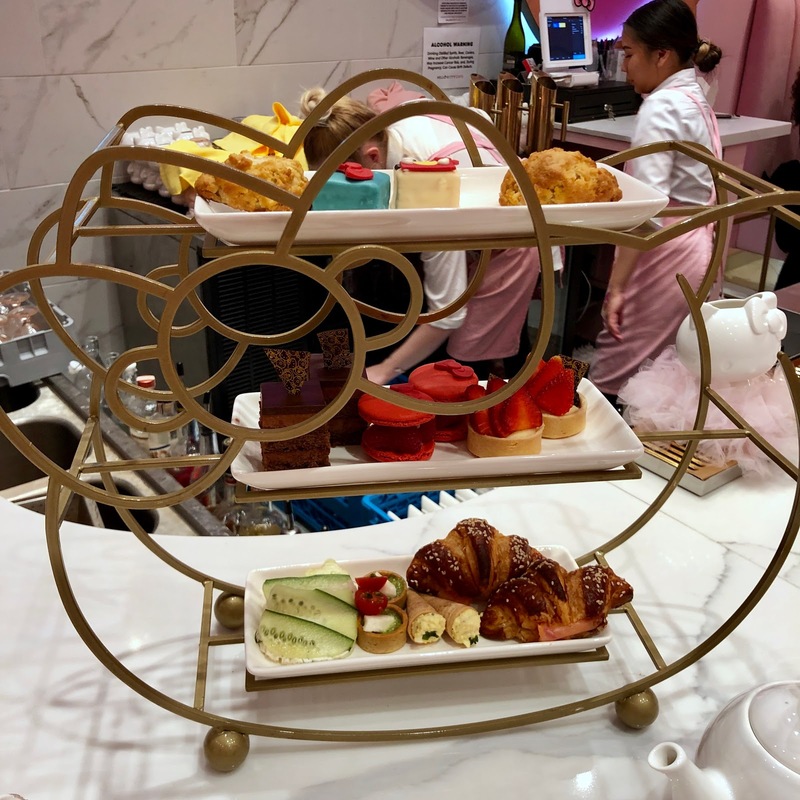 The last time I was able to go to tea I was stuffed and didn't need anything more for another day. This is the cutest tea I've ever seen. I'd love to see something like this on a kid scale since I think my granddaughter would get a kick out of it. (She wouldn't eat though since she's so picky). What a fun experience to do with your bestie! That is the cutest thing ever. My daughters would absolutely LOVE it.